2P START! Live! 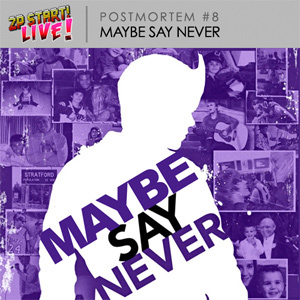 : Maybe Say Never | 2P START! Ok, I’m about 2 minutes in and I’m laughing like crazy. You guys are so much funnier than me. Hey Ray/Tim, the part where you talked about 2P reSTART, do you think we’ve done well in doing our own thing? p.p.s. please excuse my nigh certain inaccurate estimate. Ya know, right when you were talking about making a Lace game I thought about making a Super Mario World ROM hack of it like I used to (custom sprites, using the soundtrack, etc etc). And then you guys go into talking about doing something original and I think, “DUDE, COME ON!” Either way, I’ve only played around with Lunar Magic for less than an hour years ago, so it wasn’t like I could make it anytime soon anyways! A fan project if people are up for it? Anyways, sat down again for 50 minutes to listen to you guys and had some great laughs from it. The section were you talk about how technology’s going to affect the future was interesting as well. And we still need that Bieber-faced Sonic! Nice Podcast guys! (I haven’t commented in a while, so that goes for all the past Podcasts I’ve not commented upon as well). Never thought I’d hear Youtube Poop mentioned on 2P START! I have to admit I’m a YTPer myself, though much less so than I was in years past (in retrospect, my more recent videos aren’t even the traditional “YTP style” anymore, but more like video shorts with comic-like jokes/references). Granted 90% of YTP videos out there now are just flux’d-up trash, there are some gems out there, though at the same time I’ve been known to have an odd sense of humor. Good to hear you’re back home safe, Ray; and best wishes with moving, Tim! Looking forward to Postmortem Comic #2. Hey, I was wondering. I have 2P Start Live subscribed on my iTunes, and TWO “New 2011” popped up. Is it an edit or an error? Throughly enjoyed the conversation, guys! A great discussion on a wonderful range of topics, seasoned with humor and insight. (Huh, that sounded like a promotional plug from a book cover for some reason.) Anyway, thanks for taking the time to record, edit, and post it! YES! YES! YES! YAY! WOOHOO! YES! YES! YAY! AWESOME! PS, is my gravitar working? It says anonymous. I’m Wolf5297. yes it works, its like a glitch I have it to. Tim, I don’t think you can compare Android on the Nook Color with iOS on iPad. Those are two very different things. A better comparison would probably be iPad iOS with Honeycomb Android. Thanks you guys for another great podcast! It still cracks me up at how much harder Sonic fans actually try when they make their Sonic fan games then the people who are actually getting payed to make them. I haven’t tried any of the Bit.Trip games, although they do look like fun. I guess I’ll just wait and see if they do make a package that has all of the games in one. I got the last sticker in Brawl about a month ago. Although I did do the fast easy way to get the last seven rather then play the game to death. Speaking of fan man Smash Bros. games, have either of you two heard of Super Smash Flash 2? It’s not finished yet but the demo is already quite impressive. I’m not huge on fan made games, but I’m definitly looking foward to when the final version comes out. As silly as it sounds, you guys really are the best video gamer “role models” out there. Or at least, as much of a role model that you can get with video games. And I am definitly looking foward to your new comic. Oh, and my parents met in WYAM. Heh heh. I think it is the sticker factory. The one with the conveyer belts and sandbags? I’m curious though, what to you have against the sticker factory? Good to hear you guys once again and looking forward to the upcoming comic. Also, I’ve been following info on Video Games Live since it started in 2005 and am looking forward to finally, finally seeing it for myself later this month. Hopefully it’s worth the wait! I found it very ironic that the Verizon iPhone came out the day that Ray came back from Haiti. 😉 We just got it, and it works just as well as the AT&T one, only with a better network. Cubic Ninja is also a gyroscope game for the 3DS, and it’s not 3D, so they clearly know what they’re doing. You’re completely justified in your Doom award Ray. Tim, just out of curiosity, will you still refuse to get the 3DS? Because you said if it was $250 you wouldn’t get it, and low and behold that’s what it’ll be! p.s. Oh and Tim? Um…….. the comic isn’t up yet. Have you worked on that script yet? Yay! I loved this podcast; thanks again for taking the time to record this; especially Tim with his two kids and impending move, and Ray for going the extra mile to edit it. I thought Ray’s analogy of games to sports was pretty funny, since just the other week my friend was bashing football for being “a bunch of jocks beating each other up over a piece of leather” (or something very, very close to that effect) and I responded “some could say the same about video games, except with flashing lights and silicon.” Personally, (though possibly incorrectly) I consider myself a person with a foot in both camps, who can enjoy both sports and video games moderately, or love both a classic chiptune (http://www.youtube.com/watch?v=7f9pnzcP1fU) and a classic hymn (http://www.youtube.com/watch?v=VSiFk5_ssR0). All in all, loved the show! EPG! But hey. 2 and a half weeks ago I began listening to Podcast #1. Now i’m done with Post Mortem 8! Wow, i’ve actually been reading your comics for a year and a half. But the podcast is the real deal. Thanks for all the laughs and I hope there’s many more to come. Apparently not. CAUSE I DID IT. It is impossible and Ray (not Tim) will back me up. You crazy late riser!!!!! I listened to the whole “original” series in a whole week. Hahahahahaha! I beat you with stickers! Got it in September! Games are just played for fun. They don’t understand that. I only like orchestrated music because of video games! Classical orchestrated music gives me a headache. Wait you are having D.L.C. NOW? Keep yourself alive by queen anyone (for telling you to be satisfied where you are)? Hahahahaha, funny Podcast guys! Nice conversation and was fun throughout! Hey guys I guess it’s time for me to fall into my grave…..wait…..that’s wrong. Let me try that agin. Hey guys I guess it’s time for me to RISE FROM MY GRAVE. I’ve only been listening to the podcasts for about two weeks and the comics for about a month and I’ve finally finished going through both the comic and podcasts my favorite comic was definitely the what not to do for Bowsers minions. I think I may have woke up my neighbors I was laughing so loud. Seeing as I’ve RISED FROM MY GRAVE, I want to give you guys a shout out from South Carolina. Keep up the good work guys I’m always checking back for more greatness. Thanks to Matt from BitF for bringing me to the site. Consider my grave, Risen. and for the record you can just call me Awesome. Mr. Awesome. Hey guys I guess it’s time for me to fall into my grave…..wait…..that’s wrong. Let me try that agin. Hey guys I guess it’s time for me to RISE FROM MY GRAVE. I’ve only been listening to the podcasts for about two weeks and the comics for about a month and I’ve finally finished going through both the comic and podcasts my favorite comic was definitely the what not to do for Bowsers minions. I think I may have woke up my neighbors I was laughing so loud. Seeing as I’ve RISED FROM MY GRAVE, I want to give you guys a shout out from South Carolina. Keep up the good work guys I’m always checking back for more greatness. Just for your information, I still keep my “at least twice” podcast listening ratio. And sometimes go over some old one as well. I heard there are tons of Lace’s comic ideas, I definitely look forward to that. If you guys are gonna do “Rise from your grave” the next postmortem. I have risen from my grave and I hAvE fOuNd YoU rAy. WhEn I fInD oUt WhErE yOu LiVe…YoU wIlL bE dEsTrOyEd. NOOOOOOOOO!!!!!!!!!!!!!!!!!!! MY IPOD WONT LET ME DOWNLOAD ANY OLD EPISODES ANYMORE!!! CURSES!!! Being that it’s in fashion to RISE FROM ONE’S GRAVE I should RISE FROM MY GRAVE. evan thought i have commented on this podcast before and others i will any ways. viva the late revolultion!!!!!!!!! Time to finish my comment. I got the site from Brawl in th Family when they did there fuesst comic for you guys and i’ve been hooked ever since. I have listened to all the pod casts and read all the comics (whoopty doo). Is to late to join Ray’s (not Tim’s) undead army? Mabye (gasp) get mentioned on the next postmordom along with RaYbOx and They Call Me Mr. Awesome!?!?!?!?!?! please. BTW would you put the next one up already? Wow it’s been a year since they ended 2pstart ………………………………………………………………………………………… Those monsters.